This website and Airport Speedway Facebook page are the only official sites to be used for information purposes. Please also be aware that there are other Facebook groups/sites are using our name in any combination is unauthorized, because of this we take no responsibility nor are we associated with these unauthorized sites. If you are identified making written comments detrimental to the Club or track on the internet, i.e. Social Media, you will be subject to disciplinary action. OUT with old - IN with the NEW! Look for our new 2019 Front Sign when you arrive at Airport !! "This year, Byron Motorsports, partnered with their sponsor Independence Wealth Services of Hockessin, De will be sponsoring the 250cc class in support for suicide prevention. Please join us in supporting this cause by coming out to the races. We hope to see everyone there! Donations will be accepted and all those collected will be donated to help support suicide prevention. There will be an added payout to the 250cc drivers. Annual Scout Night with packs 960, 660 and 30 will be in the stands. Admission will be free for scouts in uniform and $3 per parent that's in attendance with them. Last but not least we have a special appearance by the mini late model racers. follow instructions. You will be able to fill out the form on your computer and print it out. Any membership renewal or fee not paid by April 15th will be charged an additional $5.00 late fee. driver's license as proof of age. This is a BMMRC requirement per the BMMRC By-Laws Racing Rules and Regulations. Reminder to Individual Lifetime Members: If you are planning on being a driver, you must pay the drivers upgrade fee of $10.00. Payable with annual dues. This fee is for Club car registration and must be paid by each Club member registering a car. All registered cars must have been inspected and competed or attempted to compete in at least three (3) point races during the registration year in order to retain its registered Club number for the following year. the work or paying a fee of $200 in lieu of work prior to the first scheduled season Point Race. as proof of being registered. See Sandy at sign-in booth or any Safety inspector at the track to fill the form out and receive the sticker. Must be at least 16 years old to dive them in the pits. If you are a visiting driver planning on racing at Airport Speedway this season, you must fill out the form for the 1099-Misc. then take the form to the Sign-in window the first time you plan on racing. BMMRC requirement per the BMMRC By-Laws Racing Rules and Regulations. All cars entering the track for all race events must have the appropriate Race Receiver. All cars entering the track for all race events must have the appropriate working Race Receiver. If not equipped with one, car will not be scored and sent to infield. All features re-starts after the first completed and recorded green flag lap, will be lined up by the flagman�s signal, and will be double file, up to lap 10. If caution occurs on the same lap within (more than 2) the first 10 laps, the restart will go single file. advertise at one of America�s fastest growing spectator sports. Auto racing has always been a positive venue to reach potential consumers with various products from household cleaners to auto parts and supplies. With a wide range of people attending each event there are opportunities to reach a very diverse group of people. 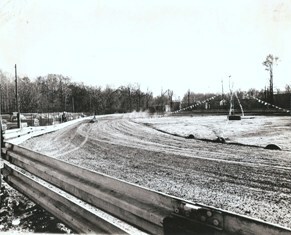 Airport Speedway has been offering some of the best racing entertainment for over 50 years. The track offers four weekly classes that average over twenty cars per class each night. The track is very fan friendly and offers affordable entry fees and children under six are free. The Airport Speedway is a 1/8-clay oval racetrack, and is always in good race condition. This is always an exciting night to treat family, friends, and business associates to a great night out. Be part of one of this country�s fastest growing spectator sports. We invite you to share any ideas you may have on how we could better help and promote your company. These are just some ideas to help you see the opportunities out there. We welcome your suggestions and hope to be able to help each other reach both our goals. 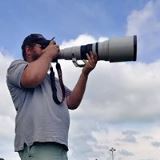 Auto racing is one of the fastest growing sports in the country and we would like to give you the opportunity to benefit from the many opportunities to promote your company. We are confident in the fact that we can together help each other reach our goals in our separate areas of interest. We invite you to join us in this up coming racing season and be part of all the excitement. 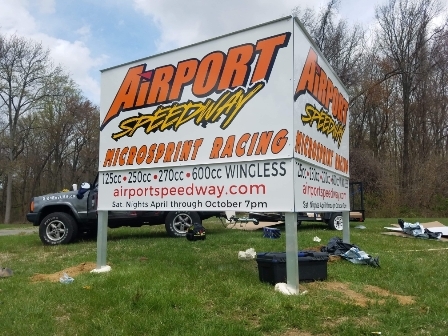 We hope you would take advantage of this opportunity to advertise your product at Airport Speedway. Feel free to download your copy of our Sponsorship/Advertisement form today! Airport Speedway uses RainedOut and delivers alerts when needed directly to your mobile phone as SMS text messages or email. If you would like to be notified by SMS or email on events or cancellations, click Rained Out and follow the instructions to sign up.